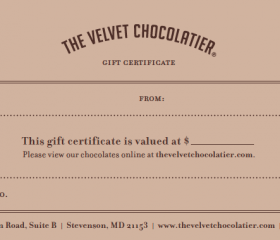 The Velvet Chocolatier offers oodles of chocolate gift ideas, but chocolate gift cards are perfect for any occasion, or just as a casual gift to say thanks. The next major holiday is always right around the corner, and we know you probably haven’t bought all of your friends and family gifts yet. Whether last minute or not, chocolate gift cards are the perfect gift solution for nearly anyone. After all, when’s the last time you heard someone complain about receiving chocolate as a gift? Our chocolate gift cards are available to purchase any of our delicious chocolate treats.